While adjustment layers are quite powerful, the ability to combine them with selections makes them infinitely more useful. 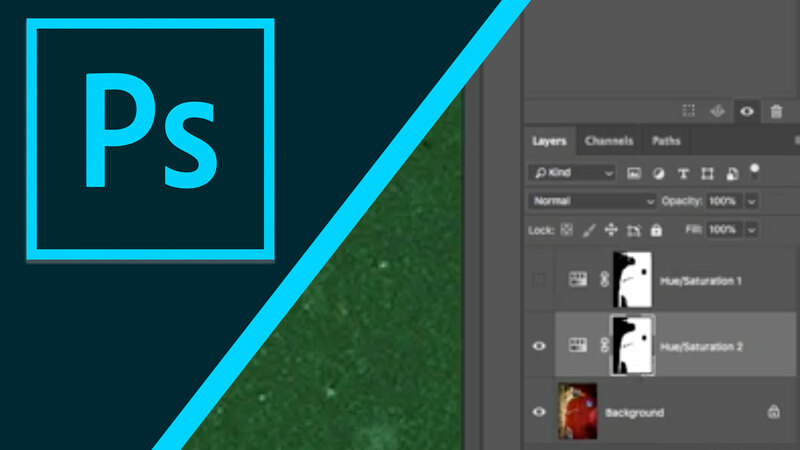 Photoshop offers several incredible selection tools; I’d like to show you a few of my favorites and how those selections can be stored right with the adjustment layer by adding a layer mask. Let’s revisit that concept of masks a bit more. In this case you see a scooter shot on the streets in Italy and it looks very much like a blue scooter. However, if I turn off that adjustment layer, you’ll see it was in fact red. Well in order for this to work, it’s important that the adjustment is precisely applied. For example, if we take a look here at just this layer and disable the mask you’ll see that if it’s applied everywhere we get unwanted shift and so it’s important that we control exactly where this falls by using something like a selection tool. Let’s turn that layer off and start this from scratch. I’ll choose the background layer here and I’m gonna invoke one of the many selection commands. One of my favorites is Select Color Range. And this makes it easy to choose an area. So if I click here, it starts to make a basic selection. Now holding down the Shift key, I can drag through to select more areas and add it to my selection. Additionally I can also just click here on the thumbnail or the mask and it’s going to update as you see there but maybe it starts to select things you don’t want like in this case the background that also had some red. So I can try the Localized Color Option if I want and it’s a little more precise. Now by adjusting the range, I can control how far each click adds. So you see here I can start to go in and pick up more of the scooter, getting the shadows and the shade there, getting the handles and then holding down the Option key or Alt key to subtract and remove. And you can watch what happens. You can also find it useful to click right there on the image. Additionally, besides the range command, the fuzziness command is gonna control what else is picked up, so you can combine those two together to add or subtract as needed to really get a precise selection. In the case here of this plasticky and metal object, a little bit of shininess and some fall off is pretty important. Now what I can do is click the OK button to invoke that and turn it into a selection. Now you might not know exactly what’s being selected here because the marching ants really only show up for things that are over a 50% selection. If you want to change that, you can also go to select and choose the Select and Mask command and this will give you some visible feedback. Now, it’s very easy to start to play with sliders like Edge Detection here and Smart Radius and it starts to adjust and grow. You can also smooth things out a little bit and if there’s holes in the mask or even shift the edge in or out to expand it and this makes it easy. You’ll notice too that holding down the Shift key here you can actually start to click and drag and more areas are going to be added to the selection and then it will refine. So you can combine these as needed or even just drag through without the Shift key and let the tool do its magic as it tries to find more areas. I find that these two working together tend to be a great way to make a more accurate selection and it can help me really refine what should be chosen. So the Color Range command is very useful but the Select and Mask command gives you great visual feedback. Now I like this but I’m concerned that possibly the Vespa here might get colorized so we might have to paint that out but let’s click the OK button here and tell this to output to a selection. Now you see we’ve got a great active selection and under the Adjustment section, there’s a myriad of tools to try but we’ll go with the simple one here of Hue, Saturation. Now by checking the Colorize box it’s very simple to drag through and pick the color that you want. And dial that in so it looks good. In this case, I see that a few areas were missing so I can still select that mask and then just add to it. I’ll press B for my brush tool and then I can come on over here and choose a brush from the available brush settings. Now what I can do is paint with white and you see it’s very easy to add or subtract. If you were to paint with black, it would become removed. So this just makes it simple to go through and paint in the color shift or hue as needed. Now besides using a paintbrush tool, you can also go in and refine the mask, playing with select and grow commands but sometimes it’s just a matter of a little bit of trial and error and the ability to touch up is important. Scrolling through it looks great. I just wanna remove that here on the word Vespa so I’ll switch this over to black and now I can paint to subtract. Now you see it gets a little tricky here depending upon the accuracy you might have a hard time. So this is where it might work to actually turn that off and select the layer. Now using a tool like the Magic Wand, I can actually just start to click and select that or you can use a different tool that’s similar called the Quick Selection Tool, it’s actually located here with the Magic Wand and this allows you to just click and start to make a basic selection. So here all I’m doing is clicking on the words to select them, there we go, not bad. Looks pretty good, subtract that little hole there. There we go and get it decent, click selection. Too bad. Subtract the inside hole and pretty easy. Now these sorts of advanced selections do take a little bit of work so you may find yourself adding or subtracting with a few clicks but when it’s in pretty good shape, what you should be able to do is now come back to that layer mask and if I don’t wanna affect that letter, I’ll just press the delete key or in this case Option + Delete to fill with the foreground color of black and you see it removes it. So these advanced masks do take a little bit of work but what you can do is paint to add or subtract. So if I want to remove from the mask, I’ll just click and paint with a black paintbrush and I can subtract and all I’m doing here is Shift clicking to remove. If you need to add, flip on over to white and paint and between soft edge brushes, lower opacities and a few strokes what you should find is it’s not that hard to fill in any of these areas. Now that that looks good, I’ll just zoom back out, take a look at the rest of the image and I see a few small areas here so I will paint. There we go and I am just painting with white to add to the mask where I want the color shift to occur. By zooming in on the high res image it’s not that hard to touch this up and remember if you get something you don’t want, just flip over to black and you can paint. And as you see, with just a little bit of work, we can very quickly shift the colors. There’s green, there’s blue, and it just gives us a tremendous flexibility to do things like recolor objects. This is very common practice in fact for things like this, automobiles, cars, catalogs, products that are for sale. The ability to use an adjustment layer and a mask and make it very simple to recolor an object or make it better match the final results after manufacturing. One of the nicest things about the layer mask is if you have a selection before you add the adjustment layer, the mask is automatically stored. And remember, layer masks are very easy to modify.